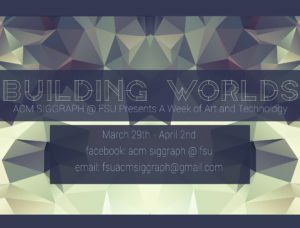 The ACM SIGGRAPH @ FSU Student Chapter announces Building Worlds; A Weekend of Art + Technology. Starting Thursday, the 31st of March and lasting till April 2nd, the series of events capitalizes on the combination of art and technology in entertainment. All events are both free and open to all who are interested. The series begins Thursday March 31st with a presentation from Jonathan Stone, a professor at FSU’s College of Motion Picture Arts and former Executive Producer at Digital Domain. Jonathan will be presenting a step by step look at the visual effects creation process in modern motion pictures by walking through the components that make up a shot from Transformers 2. He will break down and show each component of a production pipeline and how they tie together to create stunning images at 6:00 PM in Mix Theater A at the College of Motion Picture Arts in University Center A (Stadium) on campus. On Friday, the series will progress with a Skype-In discussion with Ryan Holmes, CEO and Founder of SpaceVR, who will discuss SpaceVR, the process of crowdfunding for start-ups, the future of Virtual Reality (VR), and the applications of VR in various industries. Mr. Holmes will be skyping-into the lecture hall at Domistation during the Domistation Happy Hour from 5:30 – 6:00 PM on Friday, April 1st. The Saturday morning of April 2nd will begin with a blast as several events kickoff. At 9:00 AM, the ACM SIGGRAPH Mother organization, ACM (The Association for Computing Machinery) will kick-off the ACM Programming Competition in the Love Building at FSU. The competition is open to students only (students from TCC, FAMU, or other schools are welcomes) and breakfast and lunch will be provided to participants. Teams will consist of 3 students who will work together to solve a series of programming issues to obtain a prize at the conclusion of the event at 4:00 PM. 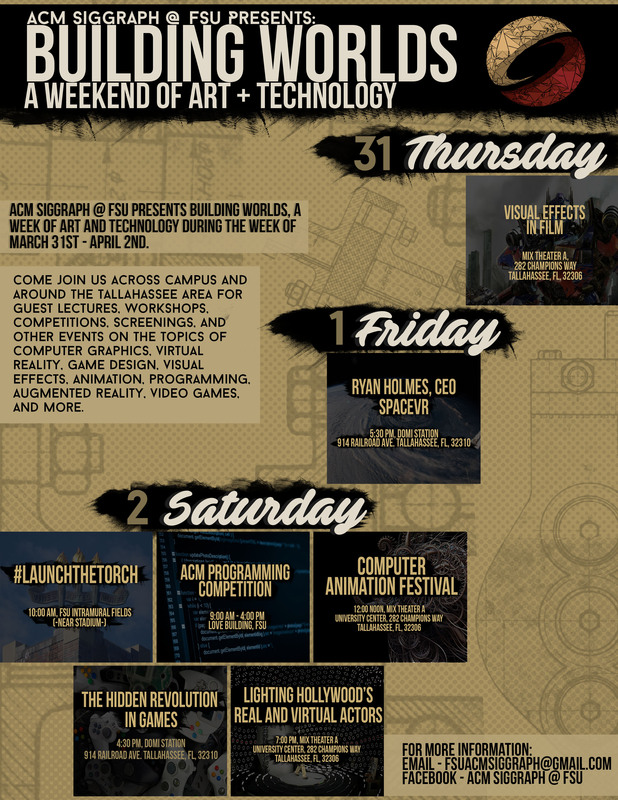 Dr. Paul Marty and his e-series course launches their 360° GoPro Rig on a Weather Balloon as a part of their #LaunchTheTorch project at 10:00 AM from the FSU Intramural Fields near the stadium. The Launch the Torch project explores emerging technologies at FSU and promotes cross-disciplinary research amongst students. After the launch, the footage from the 6 GoPro cameras within the rig will be stitched together for students to use for immersive experiences, interactive media, and other creative endeavors. At 12:00, the ACM SIGGRAPH @ FSU Chapter is proud to present the ACM SIGGRAPH 2015 Computer Animation Festival which will feature the year’s best short animated films from around the world. 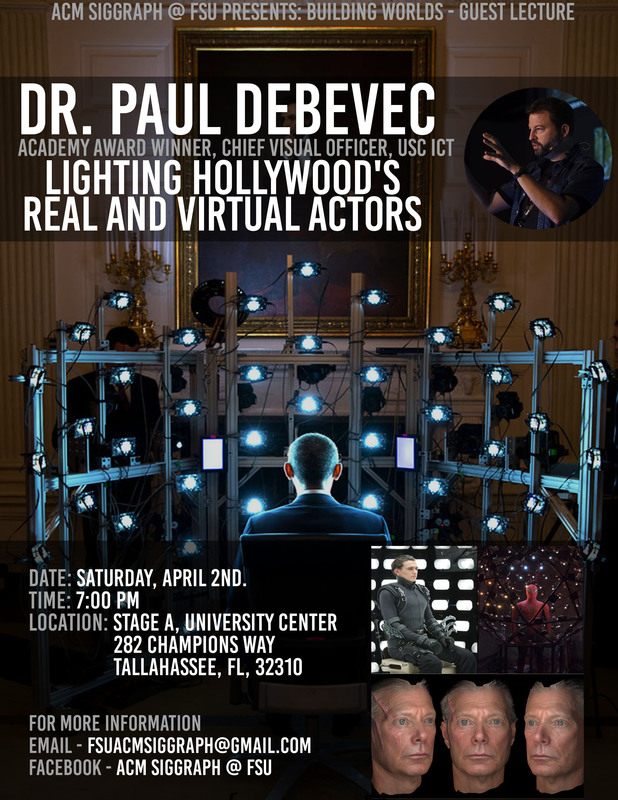 With opening remarks from Dr. Paul Debevec, Academy Award Winner and Chief Visual Officer of the Institute for Creative Technologies at the University of Southern California, the screening will take place in Mix Theatre A at the FSU College of Motion Picture Arts at 12:00 PM (Noon). At 4:00 PM, Ron Weaver, Technical Design Director from the University of Central Florida, Florida Interactive Entertainment Academy, will be presenting a lecture titled “The Hidden Revolution In Games” at the Domistation from 4:30 PM – 6:00 PM. In his lecture, Mr. Weaver will discuss the infiltration of game mechanics into everyday life and the future of the influence of video games onto our daily tasks and events. 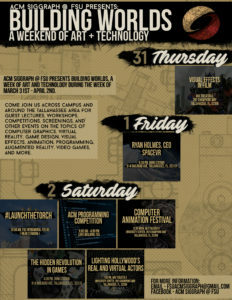 The Building Worlds weekend will close with a keynote lecture from Academy Award Winner Dr. Paul Debevec, Chief Visual Officer of the Institute for Creative Technologies (ICT) at the University of Southern California (USC) at 7:00 PM in Mix Theater A at the University Center (Stadium) on campus. 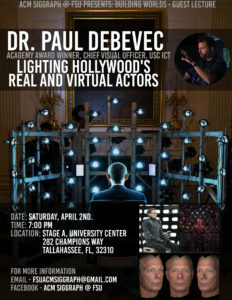 Presenting his world-renown lecture, “Lighting Hollywood’s Real and Virtual Actors”, Dr. Debevec will discuss his technique of Image-Based Lighting and how it has revolutionized the visual effects industry in Hollywood’s biggest movies such as Avatar, The Curious Case of Benjamin Button, Gravity, and more. He will also discuss how the USC ICT Light Stage helped create a 3D Portrait of President Barack Obama, and a full-body Light Stage is being used to three-dimensionally record and project testimony of survivors of the Holocaust. 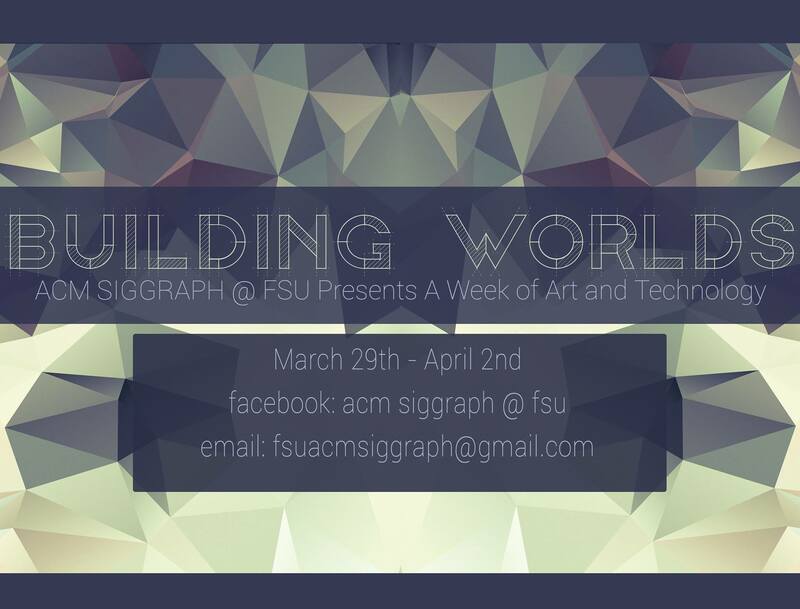 For more information, email fsuacmsiggraph@gmail.com or join ACM SIGGRAPH @ FSU on Facebook.